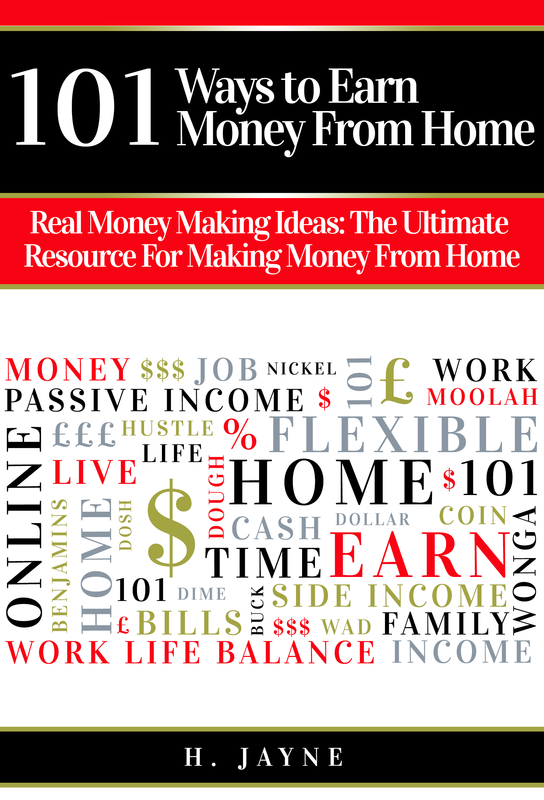 101 Ways to Earn Money From Home - New eBook Launch! I’m really excited to introduce my new eBook today, which I’ve been busy working on in every moment of my spare time for the last month or so. 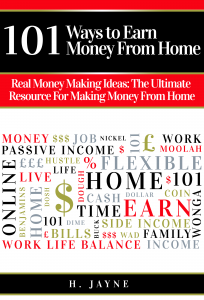 “101 Ways to Earn Money From Home” contains real ideas for making money from home or online. In case you’re wondering – this is NOT a get rich quick book! As sadly, we all know there isn’t really a way to get rich quickly. This book is for you if you’re trying to increase your income by making extra money on the side or if you’re planning to make some lifestyle changes and create your own way of working from home. Working from home is the ideal scenario for many people these days including working parents who are juggling family and work priorities, and anyone looking for some much needed work life balance away from the stress of the 9-5. You may know already that I work from home myself and I’ve been asked before about what it is that I do exactly. Well, I haven’t said much on that in the past given that I’m an anonymous blogger (sort of) and I can’t promise that part is extremely exciting, but you’ll get to find out in this book! The ideas in this book are REAL and based on my own personal experiences and research that I’ve undertaken. The reason I decided to write a book on this subject is because being able to make money from home has played a huge part in the success we’ve had in repaying our debt. Before I had my daughter, I had a well paying corporate job in Marketing. I was rather miserable though because it was incredibly stressful and even with a good salary, I couldn’t seem to make headway with the debts. I lived to my means and thought that I couldn’t survive without that highly paid job. When my daughter was born, my priorities changed and I began to see other possibilities – that my working life really could have balance. Over the last few years, I’ve managed to carve out a living for myself working from home by being self employed. Not only that, but I now have a couple of passive income streams in place that I’m working on building up as I continue the everyday work that I’m doing. I set my own hours, am able to develop new skills, work on new projects and follow my passions too. I have used our debt problems for inspiration to give me the boost I needed to start working harder and earning more – my own way. If you start out making money on the side, you’ll soon find as I have done, that the amount of money you can earn by going it alone can be limitless. There are golden opportunities aplenty, should you wish to take them. I’m frequently inspired by talented businesswoman like Michelle Schroeder, who regularly shares her amazing income reports every month from her self employed ventures and I believe we’re all capable of similar success! In “101 Ways to Earn Money From Home“, you’ll learn how to make a little money quickly on the side in addition to your day job, along with various ways to become self employed and start up a business from home. You’ll learn how to earn money in your lunch break, whilst the kids are in bed or even whilst you sleep by creating passive income streams. The great thing about making your own money is that you set the terms. You set your hours and you set your fees. You can pay yourself a bonus by working harder and harder. Whether you want to pay off debt, save up to meet your financial goals or just escape the rat race for good – this book will inspire you to begin making money from home today. Here’s what others have said about this book! 101 Ways to Earn Money From Home is available NOW on Amazon globally for just $2.99 / £1.90. The price of a coffee! Whatever your reason for wanting to earn more money, this book will give you 101 ideas and access to resources for getting started. This is a guide packed so full of information about earning from home that you’ll be able to refer back to it again and again. Download today! If you have any questions about this book, please ask away and I’d be happy to answer them. I’d welcome your feedback about my book, so please leave a review on Amazon or just email me. If you would take just a moment to share this post to your friends and communities via social media, I’d really appreciate it! Congratulations on your new ebook, I will be downloading it this evening – it can be my new commuter read. Congrats on the launch of your book!! I hope it does really well, and I’d be happy to promote it! Thank you Tonya, if I can ever help you out, please just ask! Congrats and good luck with the new e-book Hayley! Hi everyone, I should have mentioned this in the post above, but most of the ideas in this book are suitable for both UK and US residents, not to mention pretty much anyone globally. There are just a few ideas which are specific to people living in the US only. Hayley recently posted…101 Ways to Earn Money From Home – New eBook Launch! Congrats! Publishing ebooks seems like a great way to make some passive income, other than having to promote it every once in a while. Not a bad deal in my opinion! Congratulations Hayley! Been wanting to read your ebook! Im so excited about it! Awesome Hayley. I’m so proud of you for putting this together and getting it out there. I’m sure it wasn’t easy but ya did it!! Personally, I feel that online income is THE best way to go and I feel that those who purchase this book will benefit greatly from your words and experiences. Take care and congratulations again 🙂 My best to all. lyle @ the Joy of Simple recently posted…Small Town Living In The Big City! !